This article describes a synthetic method to obtain bismuth oxyiodide microspheres, which are highly functional to perform the photocatalytic removal of organic pollutants, such as ciprofloxacin, in water under UV-A/visible light irradiation. Durán-Álvarez, J. C., Martínez, C., Mera, A. C., Del Angel, R., Gutiérrez-Moreno, N. J., Zanella, R. A Facile Synthetic Method to Obtain Bismuth Oxyiodide Microspheres Highly Functional for the Photocatalytic Processes of Water Depuration. J. Vis. Exp. (145), e59006, doi:10.3791/59006 (2019). Bismuth oxyhalide (BiOI) is a promising material for sunlight-driven-environmental photocatalysis. Given that the physical structure of this kind of materials is highly related to its photocatalytic performance, it is necessary to standardize the synthetic methods in order to obtain the most functional architectures and, thus, the highest photocatalytic efficiency. Here, we report a reliable route to obtain BiOI microspheres via the solvothermal process, using Bi(NO3)3 and potassium iodide (KI) as precursors, and ethylene glycol as a template. The synthesis is standardized in a 150 mL autoclave, at 126 °C for 18 h. This results in 2-3 µm-sized mesoporous microspheres, with a relevant specific surface area (61.3 m2/g). Shortening the reaction times in the synthesis results in amorphous structures, while higher temperatures lead to a slight increase in the porosity of the microspheres, with no effect in the photocatalytic performance. The materials are photo-active under UV-A/visible light irradiation for the degradation of the antibiotic ciprofloxacin in water. This method has demonstrated to be effective in interlaboratory tests, obtaining similar BiOI microspheres in Mexican and Chilean research groups. A plethora of semiconductors has been synthesized so far, aiming for photocatalysts with high activity under visible light irradiation, either to degrade organic compounds or to generate renewable energy in the form of hydrogen1,2. Bismuth oxyhalides BiOX (X = Cl, Br, or I) are candidates for such applications because of their high photocatalytic efficiency under visible light or simulated sunlight irradiation3,4. The band gap energy (Eg) of bismuth oxyhalides decreases with the increase of the atomic number of the halide; thus, BiOI is the material displaying the lowest activation energy (Eg = 1.8 eV)5. Iodide atoms, bonded via Van der Waals force to bismuth atoms, create an electric field that favors the migration of the charge carriers to the semiconductor surface, triggering the photocatalytic process4,6. Moreover, the architecture of the crystallite has a critical role in the separa,tion of the charge carriers. Highly oriented structures in the (001) plane and 3D structures (such as microspheres) facilitate the charge carrier separation upon irradiation, increasing the photocatalytic performance7,8,9,10,11,12. In light of this, it is necessary to develop reliable synthetic methods to obtain structures that boost the photo-activity of the bismuth oxyhalide materials. The solvothermal method is, by far, the most commonly used and studied route to obtain BiOI microspheres13,14,15,16. Some methodologies using ionic liquids have been also reported17, although the expenses associated with these methodologies can be higher. Microsphere structure is usually obtained using organic solvents such as ethylene glycol, which acts as a coordinating agent to form metallic alkoxides, resulting in a gradual self-assembling of [Bi2O2]2+ species18,19. Using the solvothermal route with ethylene glycol facilitates the formation of different morphologies by changing the key parameters in the reaction, such as temperature and reaction time4,18. There is a wide body of literature on synthetic methods to obtain BiOI microspheres, which shows contrasting information to achieve highly photoactive structures. This detailed protocol is aimed at showing a reliable synthetic method to obtain BiOI microspheres highly functional in the photocatalytic degradation of pollutants in water. We intend to help new researchers to successfully obtain this kind of materials, avoiding the most common pitfalls associated with the synthesis process. NOTE: Please read all the material safety data sheets (MSDS) before using the chemical reagents. Follow all the safety protocols by wearing a lab coat and gloves. Wear UV protection safety glasses during the photocatalysis tests. Be aware that nanomaterials may present important hazardous effects compared to their precursors. For Solution 1, dissolve 2.9104 g of bismuth nitrate pentahydrate (Bi(NO3)3∙5H2O) in 60 mL of ethylene glycol in a glass beaker. For Solution 2, dissolve 0.9960 g of KI in 60 mL of ethylene glycol in a glass beaker. NOTE: It is important to completely dissolve the inorganic salts in organic solvent; it may take around 60 min. Sonication may be helpful to dissolve both precursors. Dropwise, add Solution 2 to Solution 1 (at a flow rate of approximately 1 mL/min). The colorless Solution 2 will change to a yellowish suspension. Sometimes, when Solution 2 is abruptly added, a black color may appear, due to the formation of the BiI4- complex. In such cases, the synthesis must be aborted and started again. NOTE: Laboratory material must be completely dried since the occurrence of water promotes the uncontrolled precipitation of bismuth oxide (Bi2O3). Stir the mixture, using a moderate speed for 30 min at room temperature. Then, transfer the mixture to a 150 mL autoclave reactor. Carefully swirl the beaker to remove the remaining suspension from the sidewalls. It is possible to add 1 to 5 mL of ethylene glycol to rinse the beakers. Make sure to tightly close the reactor. NOTE: The autoclave should be filled from 40% to 80% of its capacity in order to achieve the optimal pressure conditions to the formation of the BiOI microspheres. A soft seal of the reactor may result in the loss of pressure, spoiling the synthesis. Supply thermal treatment to the reactor in a furnace, from room temperature to 126 °C, using a temperature ramp of 2 °C/min. Maintain the final temperature for 18 h10. Then, cool the autoclave reactor to room temperature. NOTE: Do not preheat the oven or provide a rapid heating since it will spoil the formation of the microspheres. CAUTION: Do not induce cooling by washing the autoclave with cold water, as it may cause the deformation of the autoclave. Do not attempt to open the reactor while it is still hot, as this may result in the release of iodine gas. Separate the solid material by decantation and wash it to remove ethylene glycol as much as possible. Prepare a filtration system consisting of a 0.8 μm filter paper (Grade 5, free of ashes) properly adhered to the walls of a glass funnel. Connect to an Erlenmeyer flask using a pierced cork stopper. Carry out the filtration step by gravity. (Optional) When pouring the suspension from the reactor to the funnel, use deionized water to rinse the autoclave reactor. Wash the solid product retained in the filter paper—of an intense orange color—several times with distilled water and absolute ethanol (technical grade). Alternate the washing solvent until the leachate is colorless. NOTE: Please note that deionized water removes inorganic ions, while absolute ethanol removes the remaining ethylene glycol; thus, both solvents must be used. Use deionized water in the two last washing steps to remove any trace of absolute ethanol and dry the intense-orange-colored product at 80 °C for 24 h. Last, store the material in amber glass bottles, in the dark, preferably in a desiccator. Perform the X-ray diffraction analysis of the powder material, using a monochromic Cu-Kα light source, with λ = 1.5406 Å, operated at 30 kV and 15 mA. Determine the specific surface area by the Brunauer–Emmett–Teller (BET) method, via the adsorption of N2. Outgas the powder samples (500 mg) at 80ºC overnight prior to analysis. Perform the N2 adsorption measurements at -75ºC. Calculate the specific surface area and the pore volume from the adsorption isotherms. Determine the UV-visible diffuse reflectance spectra of the materials using a spectrophotometer with a praying mantis accessory. Dry the powder samples, in a laboratory oven, at 105ºC overnight. Then, carefully put 30 mg in the sample port of the praying mantis accessory. Irradiate the powder samples with a light source within the range of 200 to 800 nm in order to obtain the light absorption spectrum of the material. Calculate the band gap energy (Eg) using the absorption spectrum of the sample. Determine the secondary size of the BiOI microspheres by scanning electron microscopy. Put the powder sample on a carbon tape and then in the microscope stub to perform the observations. Determine the chemical composition of the samples by energy dispersive X-ray spectroscopy (EDS) analysis. For the test solution, dissolve 7.5 mg of ciprofloxacin in 250 mL of distilled water, to obtain a 30 ppm solution. Then, transfer the test solution to the glass photocatalytic reactor. Thoroughly stir the solution, with a magnetic stirrer, keeping the temperature at 25 °C. Bubble air to the solution at 100 mL/min in order to maintain air saturation. Add 62.5 mg of the BiOI photocatalyst to the test solution to achieve a concentration of 0.25 g/L. Immediately, take the first sample (8 mL) using a glass syringe. After 30 min of stirring in the dark, take the second sample and turn the light source on. Given that the experiments are performed under UV-A/visible light conditions, use a 70 W lamp in the photocatalysis tests. Locate the light source 5 cm above the photoreactor. Take liquid samples (8 mL) after 5, 10, 15, 20, 30, 45, 60, 90, 120, 180, 240, and 300 min of irradiation. Filter all the withdrawn samples by passing them through a 0.22 µm nylon membrane, in order to remove any solid particle from the liquid prior to analysis. Store the filtered samples in amber glass vials at 4 °C until analysis. Determine the mineralization of ciprofloxacin by analyzing the total organic carbon (TOC) concentration remaining in the liquid samples throughout the photocatalytic process. Measure the concentration of total carbon (TC, in mg/L) via wet combustion at 720 °C, in the presence of a Pt catalyst and air atmosphere. Under such conditions, all the carbon is oxidized to CO2 and quantified in an FTIR detector coupled to the TOC device. Determine the inorganic carbon concentration (IC, in mg/L) via acidification of samples with 1 M HCl, leading to the conversion of carbonate and bicarbonate to CO2·H2O, which is quantified in the FTIR detector. Calculate the concentration of TOC remaining in water samples by the following equation. ​NOTE: In order to avoid interferences and, thus, incorrect results, it is very important to remove any trace of organic impurities by thoroughly cleaning all the glass material used in the sample preparation. This may be warranted by washing several times with hot water. Here, TOCo is the concentration of total organic carbon at the beginning of the irradiation, while TOC is the concentration of total organic carbon at any time of the photocatalytic reaction. 3D microstructures of BiOI were successfully synthesized by the proposed synthetic method. This was confirmed by the SEM images shown in Figure 1a-c. The microspheres are formed from laminar structures of [Bi2O2]2+, which are bonded by two iodide atoms1. The formation of the microspheres depends on the temperature and time of the solvothermal procedure, as these parameters rule the crystallization of the oxyhalide3,4,5,6. [Bi2O2]2+ slabs start to interact with iodide atoms to form laminar structures when the temperature in the solvothermal approach goes above 120 °C1. Then, at a higher temperature and/or longer reaction time, lamellae are randomly arranged to build the microspheres1,2,3,4,5,6,7,8. 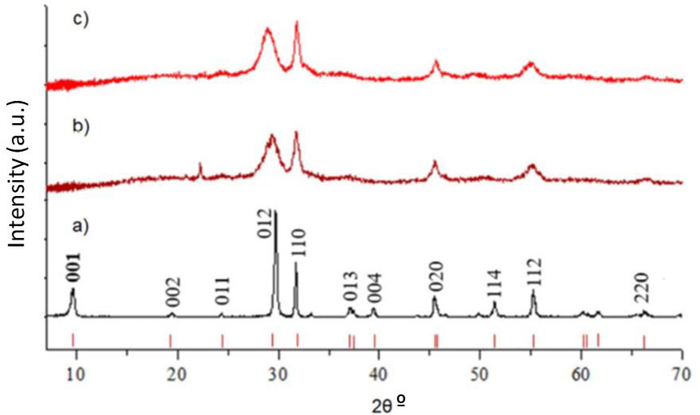 When a temperature of 130 °C was supplied for 12 h, amorphous structures were observed (Figure 1a), and iodide was not completely assimilated on the atomic lattice, resulting in the formation of the Bi5O7I material. Then, when the thermal treatment was 126 °C for 18 h, perfectly shaped spherical structures were obtained (Figure 1b). Mesoporous microspheres of BiOI were also achieved when a solvothermal treatment was performed at 160 °C for 18 h (Figure 1c). Based on SEM analysis, the mean diameter of the structures was found in the range of 2 to 3 µm. Analysis by X-ray diffraction indicated the prevalence of the tetragonal crystalline phase (Table 1), with a high exposition of the (110) and (012) planes, according to the JCPDS card 73-2062. As microspheres were formed, the orientation of the crystallite dropped due to the self-assembly of the BiOI slabs into 3D structures, which is commonly observed in previous works1,2,3,15,16,17. Figure 2 compares the X-ray diffraction (XRD) patterns of the BiOI microspheres obtained at 126 °C and 160 °C with the XRD pattern of a 0D BiOI material. From this information, it is possible to conclude that the crystallization of the BiOI material starts at temperatures above 100 °C, and then, [Bi2O2]+ slabs randomly arrange to form BiOI microspheres with no orientation of the crystalline phase. The specific surface area of the microspheres (61.28 m2/g) was quite similar to that reported for other semiconductors typically employed in photocatalysis, such as TiO2 (Table 1). A wide specific surface area may be beneficial in the photocatalytic process since a higher number of organic molecules can be adsorbed on the semiconductor surface to react with the reactive oxygen species (ROS) produced by the charge carriers (e.g., •OH, •O2-, and H2O2). The specific surface area and pore volume increased with the temperature and reaction time in the solvothermal treatment, from 9.61 m2/g in the amorphous phase to 61.28 m2/g when 126 °C and 18 h were used. No significant differences in the specific surface area were found when microspheres synthesized at 126 and 160 °C were compared; thus, 126 °C for 18 h were set as the optimal conditions of synthesis. Type IV isotherms were obtained in BET analysis (Figure 3), indicating that BiOI microspheres are mesoporous materials. The optical characterization of the microspheres unveiled their capacity to be photoactive under visible light irradiation, as noted by the band gap value showed in Table 1. A chemical characterization of the materials was performed by a compositional analysis via EDS. The composition of the BiOI materials that kept a stoichiometric ratio was maintained when the solvothermal synthesis was carried out at a low temperature (Table 2). On the other hand, when the temperature of the solvothermal synthesis increased, the iodide-loading decreased. This may be attributed to the inclusion of the halide atoms within the semiconductor lattice, resulting in a lower quantity of the halide atoms on the surface. When the solvent in the solvothermal route was changed to water, the assimilation of iodide significantly decreased to obtain Bi5O7I. 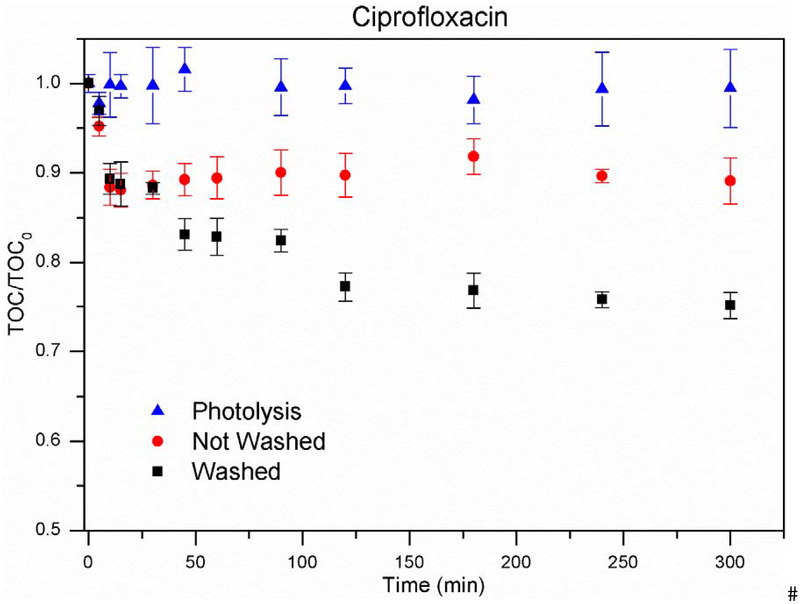 The photocatalytic activity of the microspheres synthesized at 126 °C and 18 h was assessed following the mineralization of the antibiotic ciprofloxacin in pure water, under UV-A/visible light irradiation. As can be seen in Figure 4, microspheres were able to mineralize the antibiotic compound in water via the photocatalytic process. It is clear how photolysis was unable to completely oxidize the organic molecule to CO2 (Figure 4, blue), while mineralization could be achieved, at different levels, using BiOI as a photocatalyst. These results demonstrate the photoactivity of the synthesized materials to completely oxidize complex organic molecules, such as ciprofloxacin. A comparison of the mineralization rate was made using the BiOI washed with ethanol and water (as stated in the protocol) and other microsphere materials, which were washed only with water (Figure 4, red and black). It was observed how the incompletely washed material was able to release organic carbon to the solution, interfering with the TOC measurements in water samples, as well as with the mineralization process. The release of organic carbon from the photocatalyst was observed at the first stage of the photocatalysis assays when stirring in the dark was provided. Figure 5 shows the adsorption rate of ciprofloxacin on the surface of the BiOI microspheres washed only with water and those treated with the ethanol/water mixture. Microspheres washed with the ethanol/water mixture showed some adsorption of the organic molecule, while the release of organic carbon was detected for the material washed only with water. This can be explained by the incomplete cleaning of the adsorption sites on the BiOI material washed only with water, resulting on the one hand in the release of ethylene glycol and on the other hand in the lower adsorption of ciprofloxacin, with the consequent drop in the photocatalytic activity. Figure 1: SEM images of the materials. Obtained at (a) 130 °C for 12 h, (b) 126 °C for 18 h, and (c) 160 °C for 18 h. On the left, low-resolution images are shown, while zoomed-in images are provided on the right side. Please click here to view a larger version of this figure. Please click here to view a larger version of this figure. Figure 2: X-ray diffraction patterns. 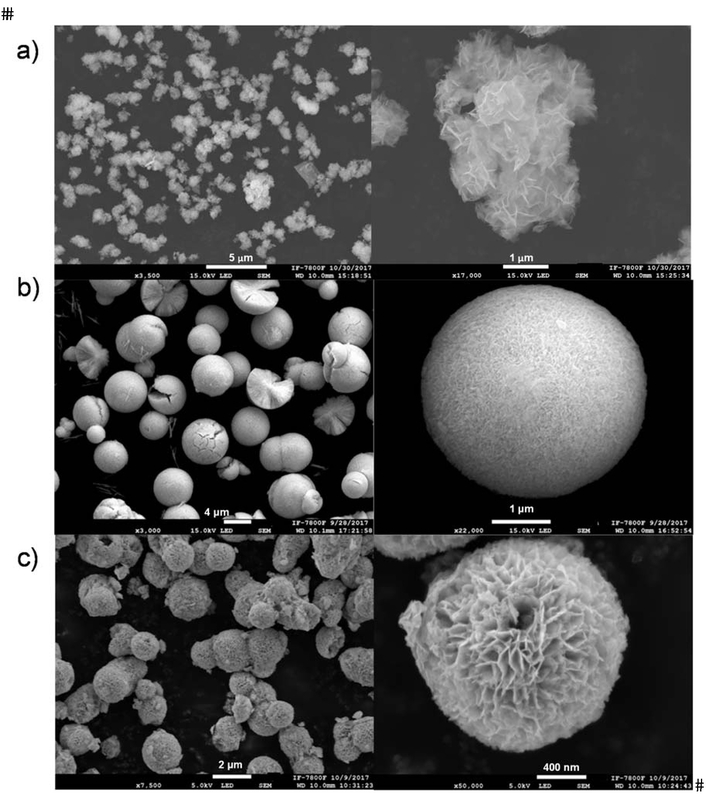 Of (a) 0D BiOI (001)-oriented material, (b) BiOI microspheres synthesized at 126 °C for 18 h, and (c) BiOI microspheres synthesized at 160 °C for 18 h. It is shown the loss of orientation of the crystals when microspheres were obtained. The diffraction patterns are compared with the reference JCPDS card 73-2062. Please click here to view a larger version of this figure. 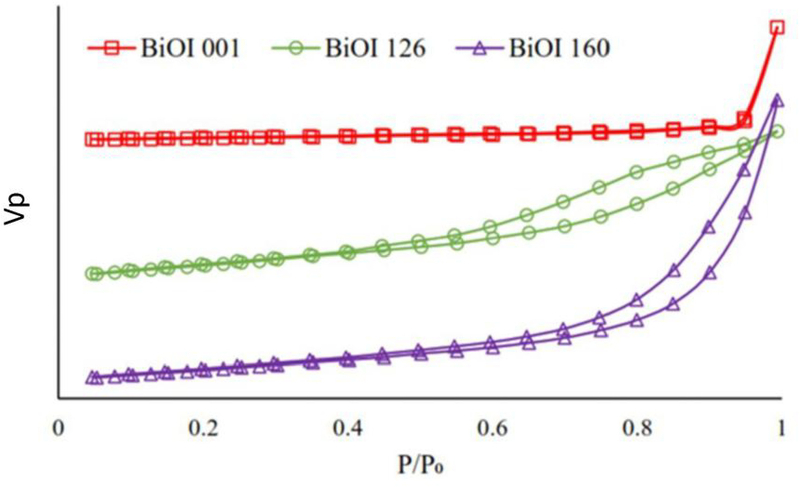 Figure 3: N2 adsorption isotherms of the bismuth oxyhalide microsphere materials synthesized at 126 and 160 °C and compared with 0D BiOI, oriented in the (001) facet. Type IV isotherms, describing mesoporous materials, are shown in this graphic. Please click here to view a larger version of this figure. Please click here to view a larger version of this figure. Figure 4: Mineralization rate of ciprofloxacin in photolysis and photocatalysis tests using the BiOI microspheres obtained with and without the washing step using the ethanol-water mixture. The experimental error is given by standard deviation bars. Please click here to view a larger version of this figure. Please click here to view a larger version of this figure. Figure 5: Total organic carbon (TOC) concentration in water samples at the beginning of the experiments and after 30 min of stirring in the dark. The experimental error is given by standard deviation bars. The determination of the TOC was performed in a sample of the test solution after this solution had been in contact with BiOI microspheres while stirring for 30 min in the dark. On the y-axis, TOCB refers to organic carbon in the test's solution, while TOCL represents the content of organic carbon after 30 min of stirring in the dark, just before the light source is turned on. 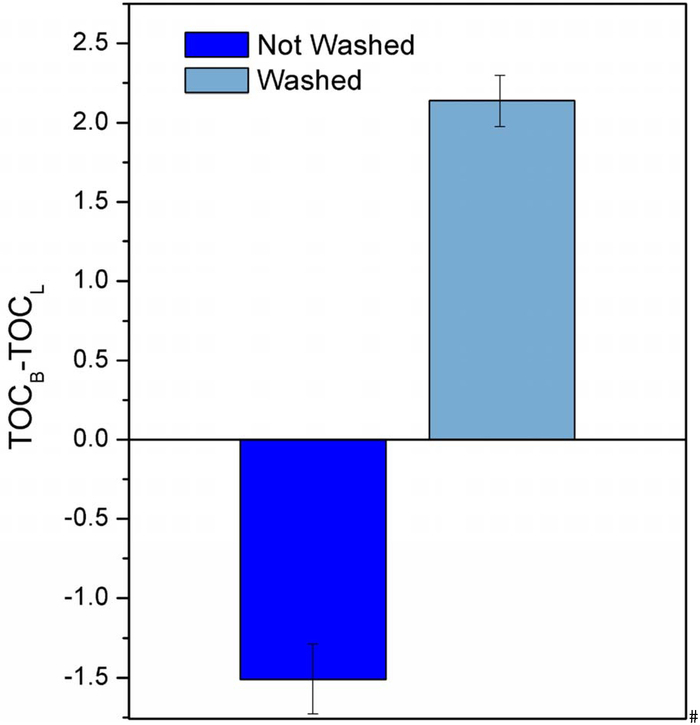 The graph shows how the material washed with ethanol and water (washed) presents a positive adsorption of the organic carbon from the solution, while the material washed only with water (not washed) expressed a negative adsorption, which means the release of organic carbon into the solution. Please click here to view a larger version of this figure. Please click here to view a larger version of this figure. Table 1: Characterization of the BiOI microspheres synthesized by the proposed method. Table 2: Chemical composition of the BiOI materials determined by EDS. We consider the mixture of the precursors as the critical step in the solvothermal synthesis of the BiOI microspheres. A very slow dripping of the KI solution into the Bi(NO3)3 solution (at a maximum of 1 mL/min) is crucial to obtain mesoporous microspheres, since it allows the slow formation and self-assembly of the [Bi2O2]+2 slabs, followed by the bonding with the iodide atoms to form the BiOI laminates. The lamellae are the bricks of the microspheres in the solvothermal step (Figure 1). Temperature and reaction time are the key factors in the solvothermal synthesis since high temperatures initially allow the crystallization of the [Bi2O2]+ slabs and, then, the arrangement of these slabs to create the microspheres1,3. Mesoporous microspheres were obtained when the temperature was maintained above 120 °C, while 3D structures were incompletely formed when the reaction time was below 18 h. Similarly, the assimilation of iodide was incomplete at a lower temperature and shorter reaction time, resulting in iodide deficient materials such as the Bi4O5I2 (yellow-colored). The correct washing of the BiOI materials must be performed in order to obtain functional photocatalysts since ethylene glycol can prevail on the material surface when it is only washed with water (even with hot water). The remains of ethylene glycol can be released into the solution before the photocatalytic tests are started, hampering the degradation and mineralization of ciprofloxacin when the light source is turned on. It is important to keep in mind that alcohols are able to raise the carbon content measured by TOC analysis disproportionately. For this reason, it is very important to wash the materials alternately with ethanol and water. When the concentration of organic carbon in water increases through the photocatalytic process, it can be solved by recovering the material and washing it with ethanol and hot water. The proposed method can be modified in terms of the autoclave size. Here, we are reporting the synthesis with a 150 mL Parr reactor; however, syntheses using a bigger reaction chamber can be performed. Based on our experience, 250 mL Parr reactors can be used in the synthesis, resulting in a slight increment of the specific surface area of the microspheres. However, such a modification has no effect on the photocatalytic performance of the material. It is important to consider that scaling up the method to higher volumes-the highest volume of solvothermal reactors on the market is 2,000 mL-requires further experiments. Limitations of the proposed method lie in the low potential of scaling up to higher volumes, given that bigger reactors are hardly found on the market. Also, as mentioned above, losses of ethylene glycol may occur when the autoclave reactor is not tightly closed. Be aware of any leaching of the organic solvent throughout the synthesis process in order to avoid spoiling the product; some autoclave reactors are equipped with a manometer to make this task easier. In case of leakage, the autoclave can be closed with the adequate safety equipment, preventing the cooling of the reactor. When this problem is solved within the first 2 h of the synthesis, microspheres with acceptable photocatalytic activity can still be obtained. Microspheres are barely formed when other organic solvents (glycerol, methanol, ethanol) are used, while using water results in the lowest assimilation of iodide, leading to the formation of the Bi5O7I (white-colored) material. A further increment of the reaction temperature (above 180 °C) may result in the chemical reduction of bismuth to metallic bismuth, which may be facilitated by ethylene glycol acting as a reductive agent. So far, there are a few alternative methods reporting the synthesis of BiOI microspheres. For instance, Montoya-Zamora et al.20 performed precipitation with EDTA, resulting in irregular microspheres with a low BET area. On the other hand, the research of He et al.21 was aimed at the mechanical synthesis of BiOI microspheres at room temperature, achieving oriented crystals with a lower BET surface area than that observed in this study. The synthetic method proposed in this work is currently used to synthesize other bismuth oxyhalides, such as BiOCl22 and BiOBr23, which have demonstrated to be efficient in the photocatalytic removal of organic pollutants in water and NOx in air20, as well as in the evolution of hydrogen19. The most recent research aims to use bismuth oxyhalides in the reduction of the CO2 molecule to produce hydrogen and light hydrocarbons (artificial photosynthesis)24. Considering that synthesis by the solvothermal method has been successfully performed with reproducible results in two different countries (Mexico and Chile), it is expected this method can be scaled up and its application in water treatment plants enhanced. The authors want to thank the Secretaría de Ciencia, Tecnología e Innovación de la Ciudad de México for the resources provided to carry out this work through the funded project SECITI/047/2016, and the National Funds for Scientific and Technological Development Chile (FONDECYT 11170431). Cary 5000 UV-Vis-NIR spectrophotometer Agilent Used for the Band gap determination by the Tauc model. JSM-5600 Scanning Electron Microscope JOEL Used for the SEM images. Autosob-1 Qantachrome Instruments Used for the determination of surface area and pore diameter. TOC-L Total Organic Carbon Analyzer Shimadzu Used for determination of total organic carbon in water samples. Yu, C., Zhou, W., Liu, H., Liu, Y., Dionysiou, D. D. Design and fabrication of microsphere photocatalysts for environmental purification and energy conversion. Chemical Engineering Journal. 287, 117-129 (2016). Wang, H., et al. Semiconductor heterojunction photocatalysts: Design, construction, and photocatalytic performances. Chemical Society Reviews. 43, (15), 5234-5244 (2014). Chou, S. Y., Chen, C. C., Dai, Y. M., Lin, J. H., Lee, W. W. Novel synthesis of bismuth oxyiodide/graphitic carbon nitride nanocomposites with enhanced visible-light photocatalytic activity. RSC Advances. 6, 33478-33491 (2016). Siao, C. W., et al. Controlled hydrothermal synthesis of bismuth oxychloride/bismuth oxybromide/bismuth oxyiodide composites exhibiting visible-light photocatalytic degradation of 2-hydroxybenzoic acid and crystal violet. Journal of Colloid and Interface Science. 526, 322-336 (2018). Meng, X., Zhang, Z. Bismuth-based photocatalytic semiconductors: Introduction, challenges and possible approaches. Journal of Molecular Catalysis A: Chemical. 423, 533-549 (2016). Wang, Y., Deng, K., Zhang, L. Visible light photocatalysis of BiOI and its photocatalytic activity enhancement by in situ ionic liquid modification. Journal of Physical Chemistry C. 115, (29), 14300-14308 (2011). Xiao, X., Zhang, W. De Facile synthesis of nanostructured BiOI microspheres with high visible light-induced photocatalytic activity. Journal of Materials Chemistry. 20, (28), 5866-5870 (2010). Chen, C. C., et al. Bismuth oxyfluoride/bismuth oxyiodide nanocomposites enhance visible-light-driven photocatalytic activity. Journal of Colloid and Interface Science. 532, 375-386 (2018). Xia, J., et al. Self-assembly and enhanced photocatalytic properties of BiOI hollow microspheres via a reactable ionic liquid. Langmuir. 27, (3), 1200-1206 (2011). Mera, A. C., Contreras, D., Escalona, N., Mansilla, H. D. BiOI microspheres for photocatalytic degradation of gallic acid. Journal of Photochemistry and Photobiology A: Chemistry. 318, 71-76 (2016). Pan, M., Zhang, H., Gao, G., Liu, L., Chen, W. Facet-dependent catalytic activity of nanosheet-assembled bismuth oxyiodide microspheres in degradation of bisphenol A. Environmental Science and Technology. 49, (10), 6240-6248 (2015). Hu, J., et al. Solvents mediated-synthesis of BiOI photocatalysts with tunable morphologies and their visible-light driven photocatalytic performances in removing of arsenic from water. Journal of Hazardous Materials. 264, 293-302 (2014). Ye, L., Su, Y., Jin, X., Xie, H., Zhang, C. Recent advances in BiOX (X = Cl, Br and I) photocatalysts: Synthesis, modification, facet effects and mechanisms. Environmental Science: Nano. 1, (2), 90-112 (2014). Qin, X., et al. Three dimensional BiOX (X=Cl, Br and I) hierarchical architectures: Facile ionic liquid-assisted solvothermal synthesis and photocatalysis towards organic dye degradation. Materials Letters. 100, 285-288 (2013). Chou, S. Y., et al. A series of BiO x I y/GO photocatalysts: synthesis, characterization, activity, and mechanism. RSC Advances. 6, (86), 82743-82758 (2016). Shi, X., Chen, X., Chen, X., Zhou, S., Lou, S. Solvothermal synthesis of BiOI hierarchical spheres with homogeneous sizes and their high photocatalytic performance. Materials Letters. 68, 296-299 (2012). Di, J., et al. Reactable ionic liquid-assisted rapid synthesis of BiOI hollow microspheres at room temperature with enhanced photocatalytic activity. Journal of Materials Chemistry A. 2, (38), 15864-15874 (2014). Ren, K., et al. Controllable synthesis of hollow/flower-like BiOI microspheres and highly efficient adsorption and photocatalytic activity. CrystEngComm. 14, (13), 4384-4390 (2012). Lei, Y., et al. Room temperature, template-free synthesis of BiOI hierarchical structures: Visible-light photocatalytic and electrochemical hydrogen storage properties. Dalton Transactions. 39, (13), 3273-3278 (2010). Montoya-Zamora, J. M., Martínez-de la Cruz, A., López Cuéllar, E. Enhanced photocatalytic activity of BiOI synthesized in presence of EDTA. Journal of the Taiwan Institute of Chemical Engineers. 75, 307-316 (2017). He, R., Zhang, J., Yu, J., Cao, S. Room-temperature synthesis of BiOI with tailorable (0 0 1) facets and enhanced photocatalytic activity. Journal of Colloid and Interface Science. 478, 201-208 (2016). Song, J. M., Mao, C. J., Niu, H. L., Shen, Y. H., Zhang, S. Y. Hierarchical structured bismuth oxychlorides: self-assembly from nanoplates to nanoflowers via a solvothermal route and their photocatalytic properties. CrystEngComm. 12, 3875-3881 (2010). Mera, A. C., Váldes, H., Jamett, F. J., Meléndrez, M. F. BiOBr microspheres for photocatalytic degradation of an anionic dye. Solid State Science. 65, 15-21 (2017). Kong, X. Y., Lee, W. C., Ong, W. J., Chai, S. P., Mohamed, A. R. Oxygen-deficient BiOBr as a highly stable photocatalyst for efficient CO2 reduction into renewable carbon-neutral fuels. ChemCatChem. 8, 3074-3081 (2016).